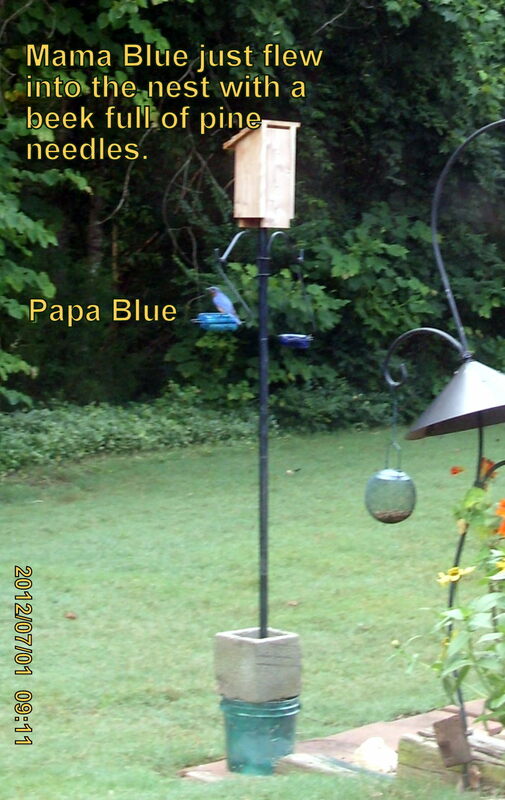 This morning, I saw Papa Bluebird back at the mealworm feeder. That is encouraging!! ~~ Sometimes I don’t know why I do what I do. 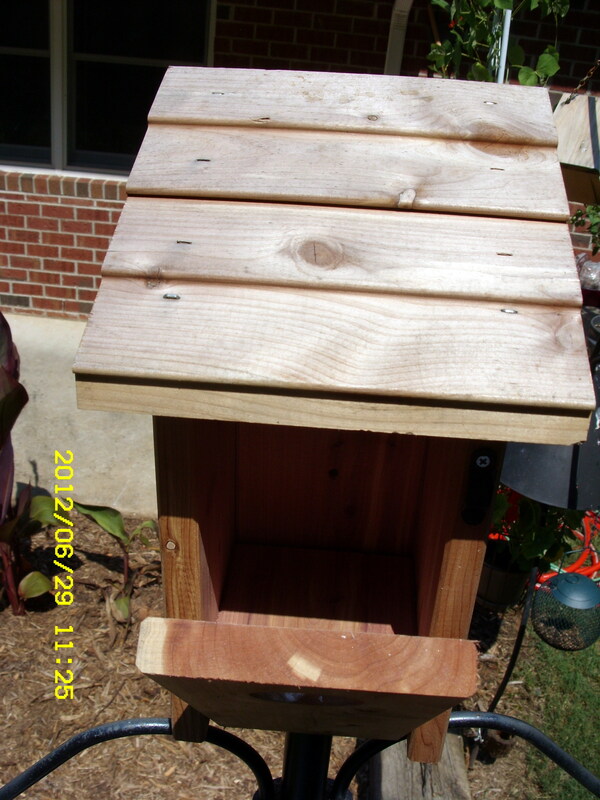 I checked another Bluebird house at the edge of my yard. “Yes,” they were building a nest there. 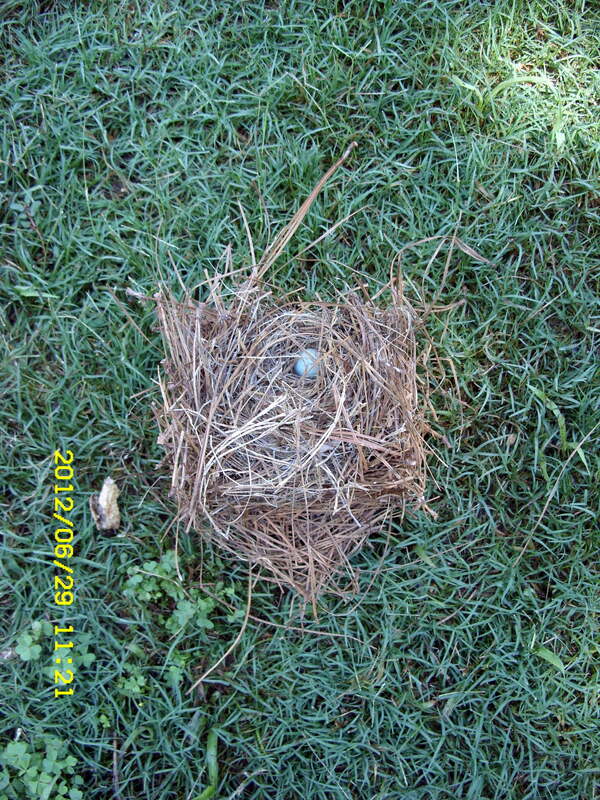 BUT mean old lady cleaned out the beginning of a nest AND she hopes, and prays, they will return to their original home. Why am I discouraging them? This bird house has a “door” that is held in place with a screw. It would be impossible for me to “peek” into the nest. 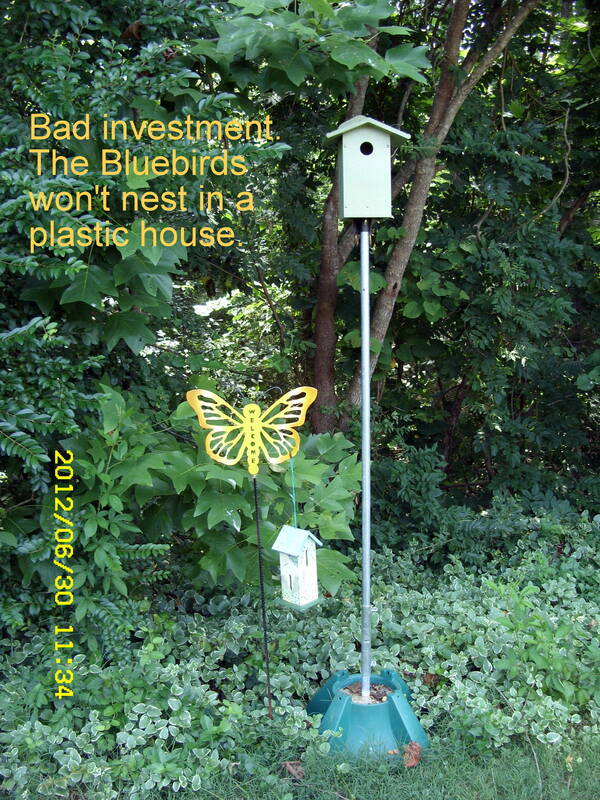 I was totally ignorant of information regarding Bluebirds when I purchased that Bluebird house. I’ve learned a lot via books and Internet. Furthermore, I can’t see this bird house from my living room. This is a gamble. Will the Bluebirds return to their original home? 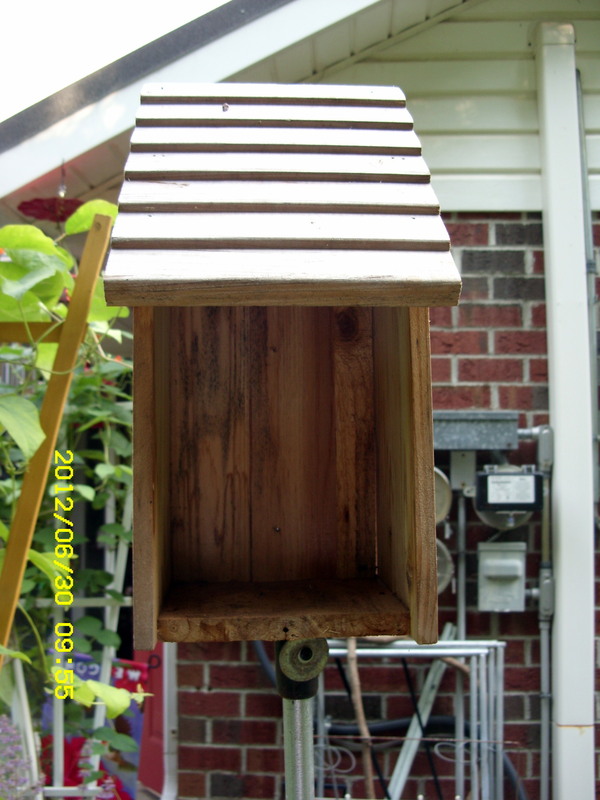 ~~ My first bird house purchase was expensive: Over $35.00!! 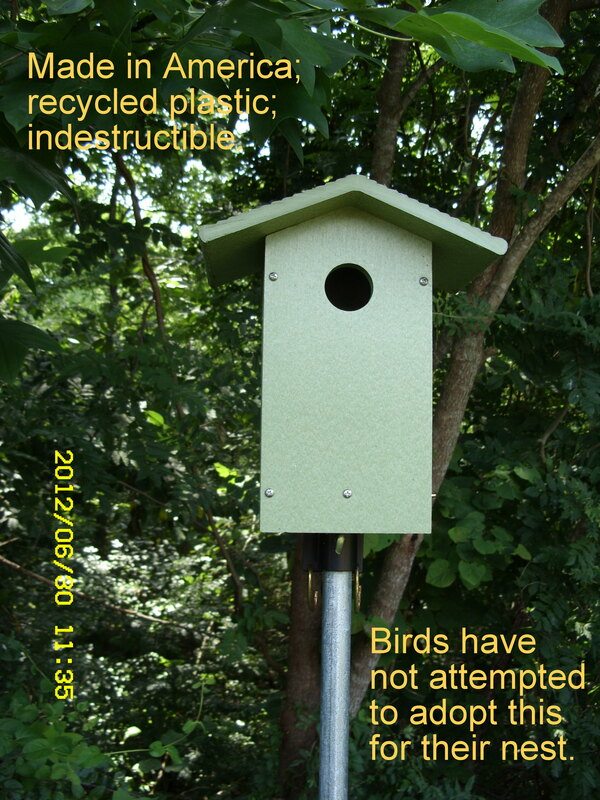 But, unbeknown to me, American-made, recycled plastic, virtually indestructible does not attract birds. I’ve learned they want a house “that breathes”–a house made of wood. Postscript, same day, 12:30 PM: They’re back!! 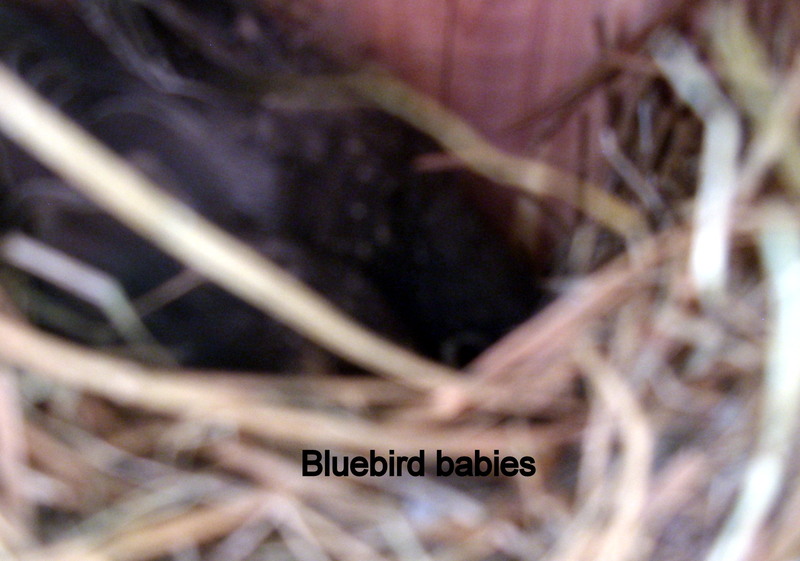 Mama and Papa Bluebird are very busy carrying pine needles to build a new nest in their previous house. Hallelujah!! ~~ Hopefully I’ll have picture confirmation soon. 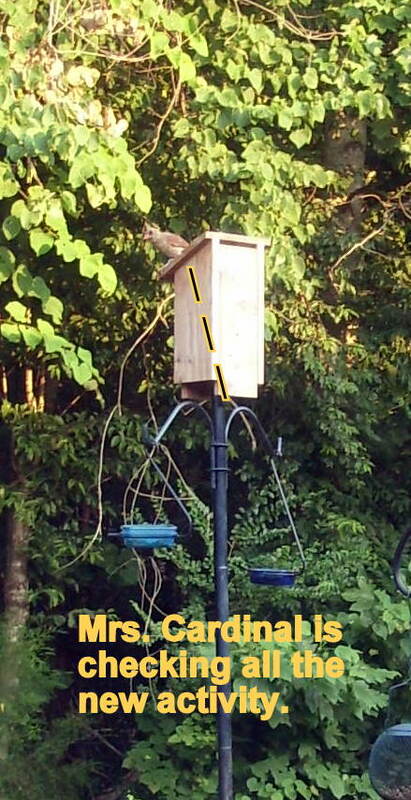 ~~ Postscript, same day, 8:00 PM: I’ve waited patiently, off-and-on all afternoon, for a picture of the Bluebird couple. They are coming and going so fast, I miss the photo opportunity!! But a female Cardinal was content to sit quietly. 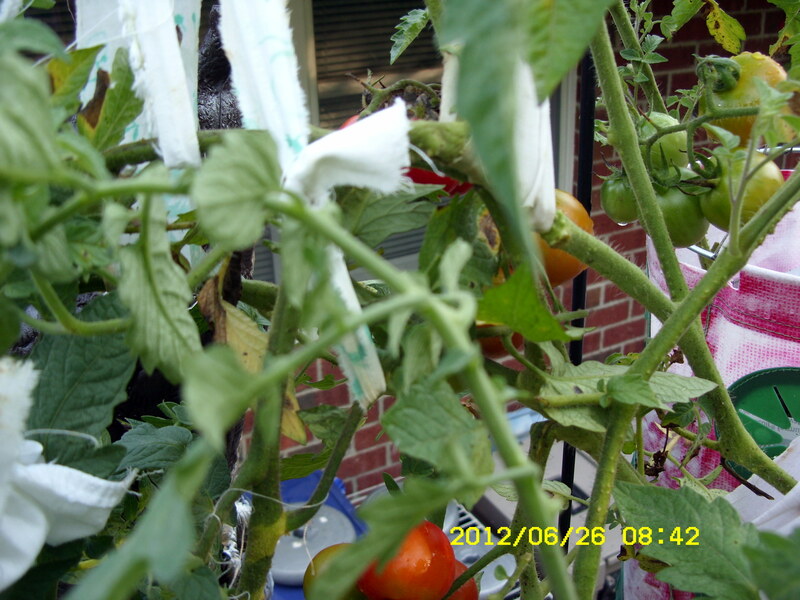 Postscript, Sunday, July 1, 2012, 9:30 AM: Mama Blue is impossible to photograph because she is flying very fast to-and-from. Papa Blue is attentive! 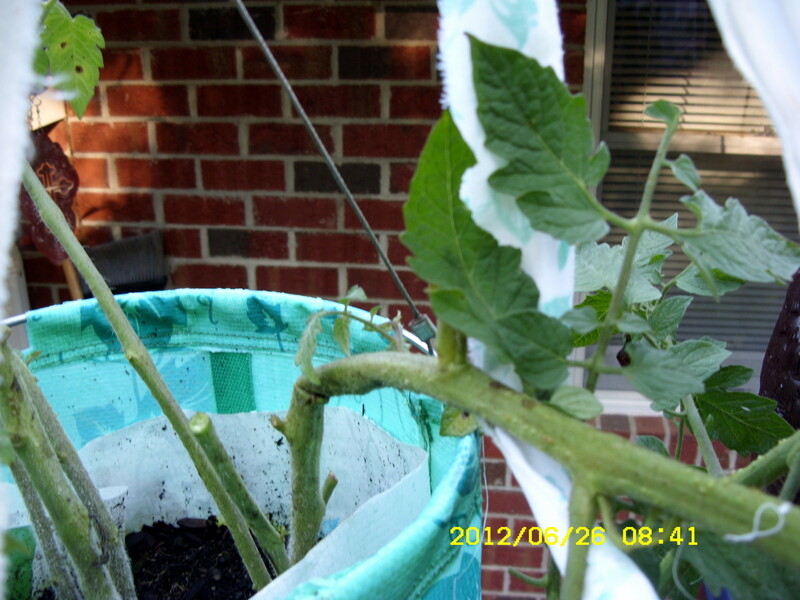 Actually, a July 3rd postscript to follow blog message A Gamble. A friend sent this link to an excellent video. 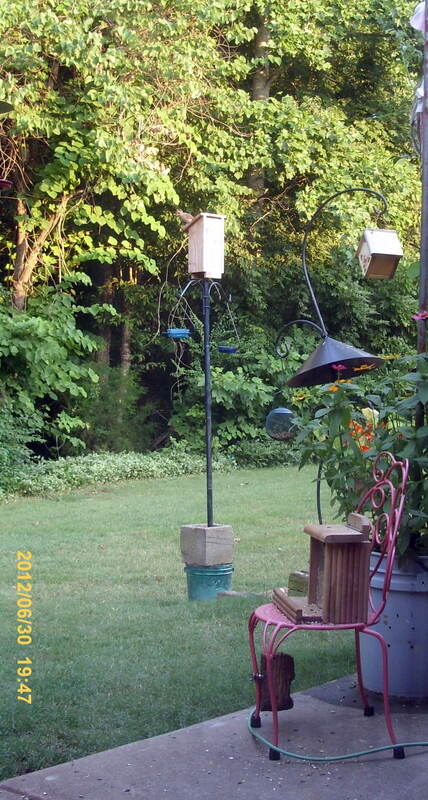 I’m envious; I wish I had similar pictures of my Bluebird family. 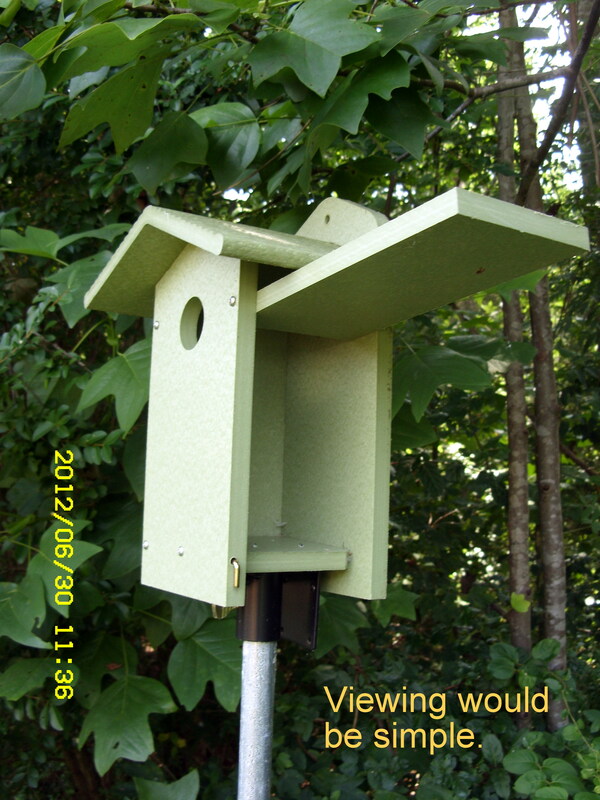 Should I purchase a little camera and install in the Bluebird house?? They exist, you know. Many months ago, I saw the entire setup at Wild Bird Center but would not / could not justify over $150. expense. I love my Bluebirds!! However, “thrifty Lorraine” opted for limited views of the Mama and babies. Well, my views were so limited I didn’t get a picture of the babies!! 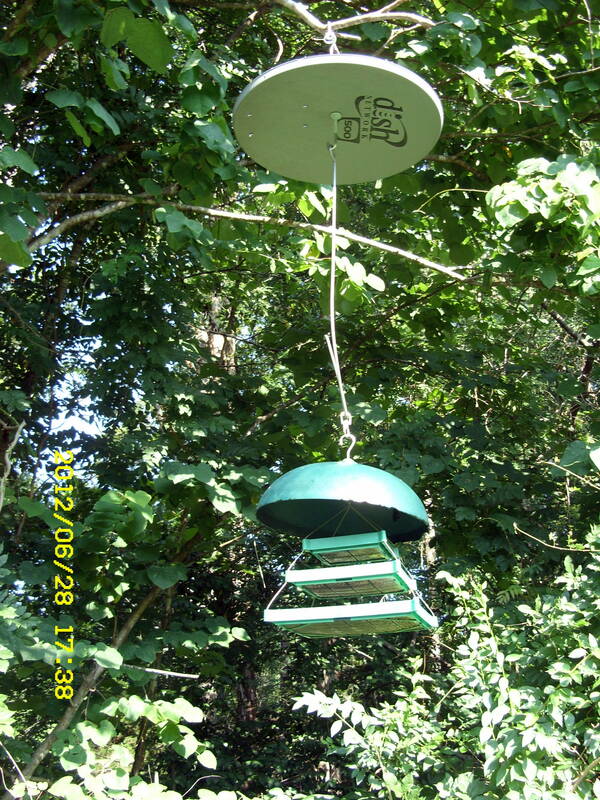 Here’s a thought: See if the Bluebirds continue to visit the mealworm feeder in months to follow; see if they “hang around” this winter. 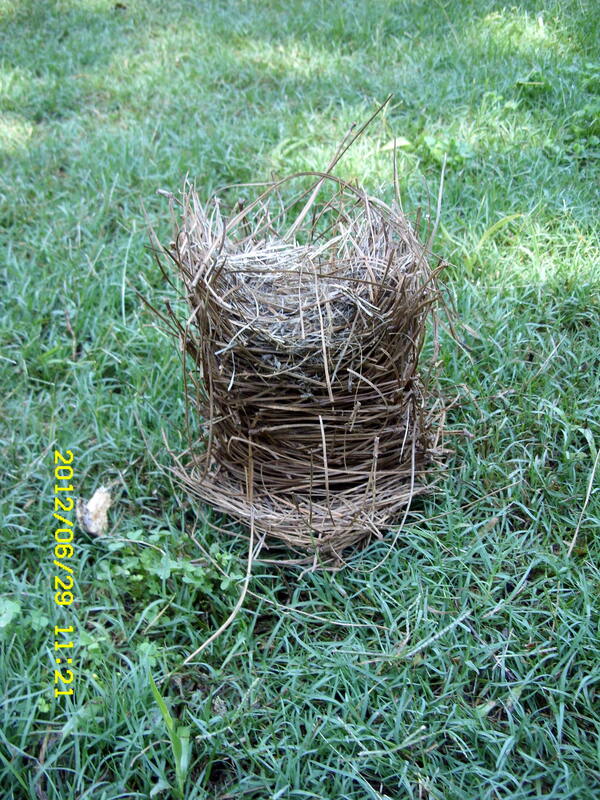 Perhaps I could count on them to build nests again next year and the purchase of a spy camera would have a tiny bit of merit. Agree?? 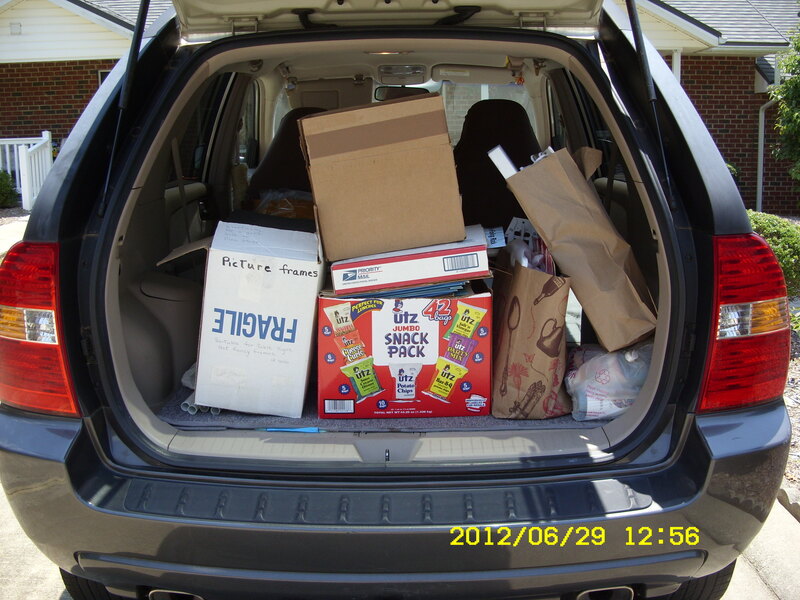 I’ve spent so-o-o-o-o much time preparing donations. I “thought” I had a one o’clock appointment to deliver several boxes to the JAARS Day Care Center–but no answer when I arrived and rang the bell. So-o-o-o-o this is not a happy day. 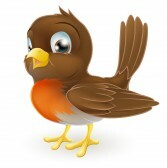 (Bluebirds are gone!) 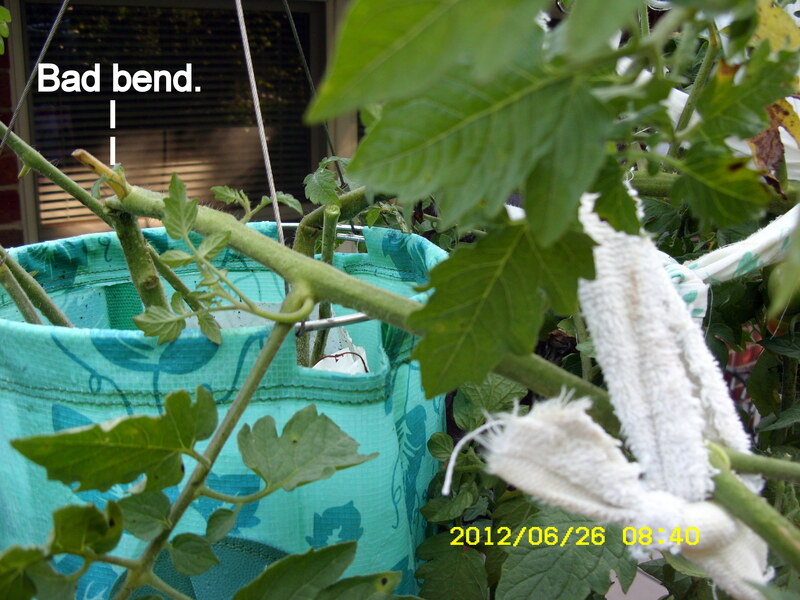 It is 100 degrees as I publish this at 1:15 PM. We are expected to experience several days of “over 100 degrees.” ~~ In the air-conditioned apartment, this afternoon, I’ll continue working on “downsizing.” ~~ FYI: I requested fewer hours at work so I could concentrate on downsizing. Now I have Monday and Friday off. 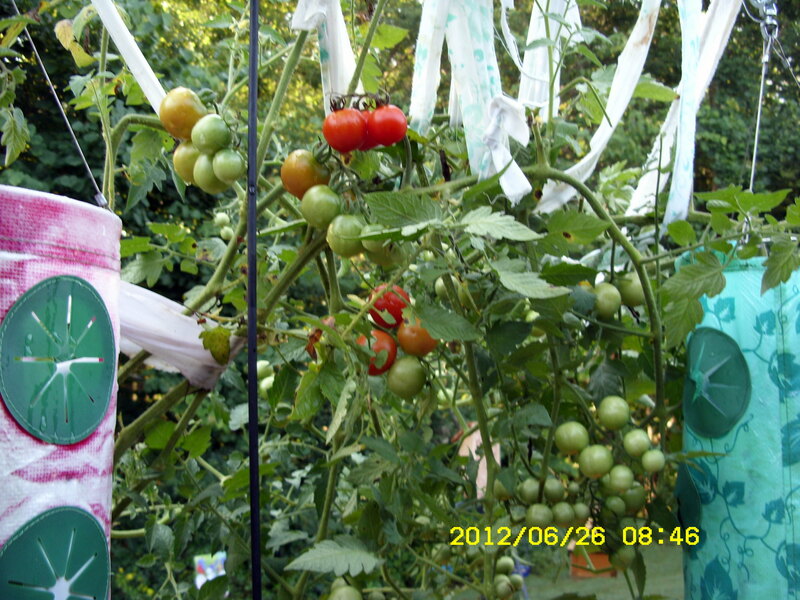 ~~~~~~ Postscript: One-hundred-four degrees at five o’clock!!! This ties the record for the hottest day in Charlotte recorded history. “Feels like 109” per the weather forecaster. Bluebird babies are gone !! Bluebird babies are gone!! I didn’t even get a good picture of them!! 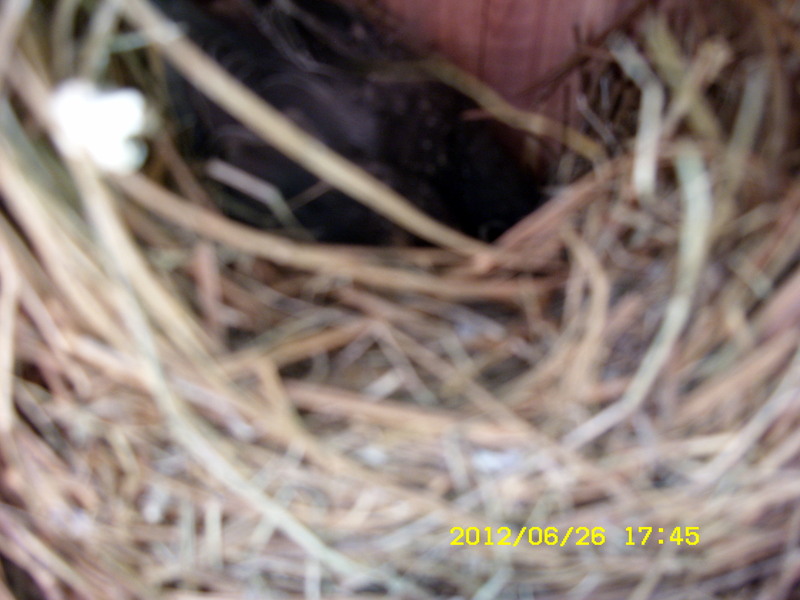 I checked the nest a few minutes ago and sensed there were no birds in the nest. 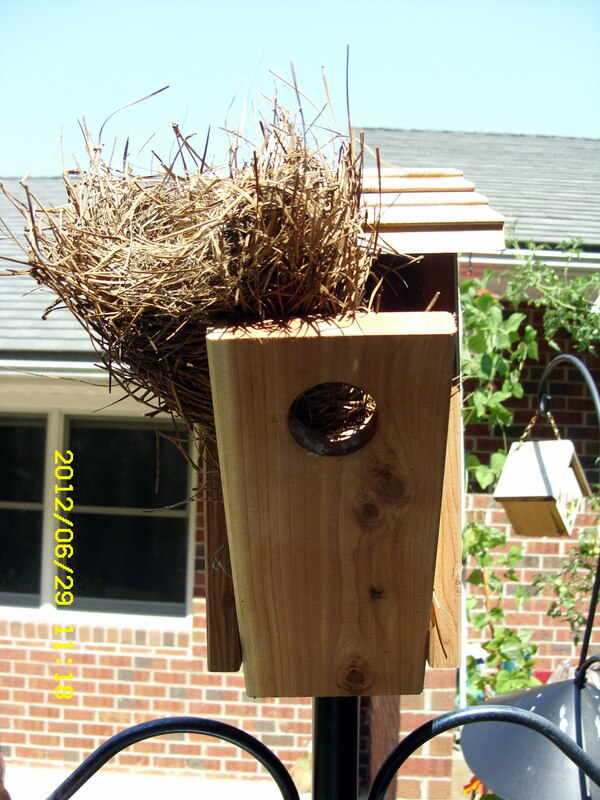 I hadn’t done this before, I gently moved the nesting material for a better look. 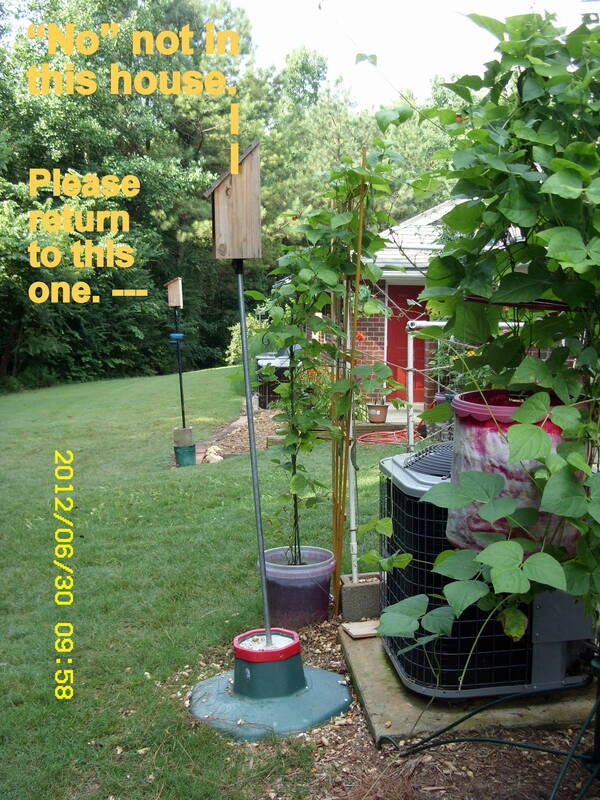 So, according to all the information I’ve read, I removed the nest and will carry it to the trash. 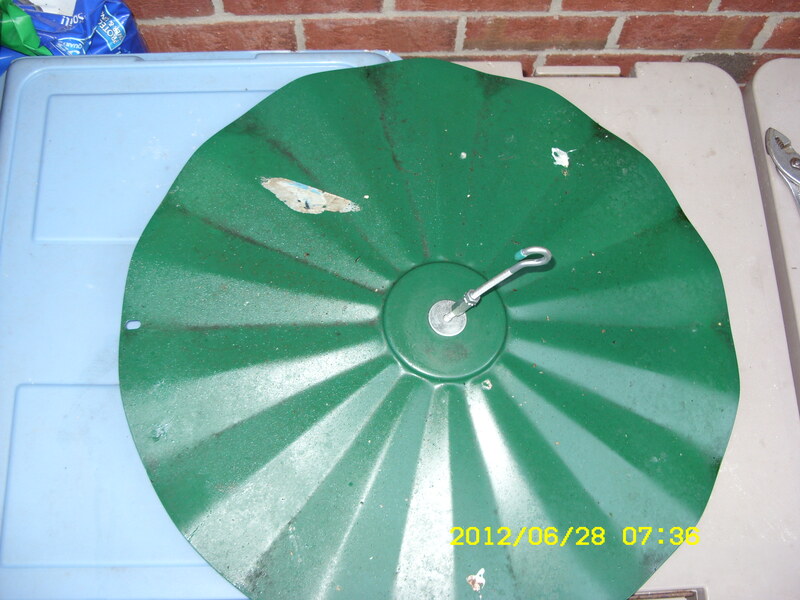 (Remove… and discard… according to literature.) Frequently, Mama Bluebird will start another nest the day the babies leave the nest. So the box is ready for a new family!! 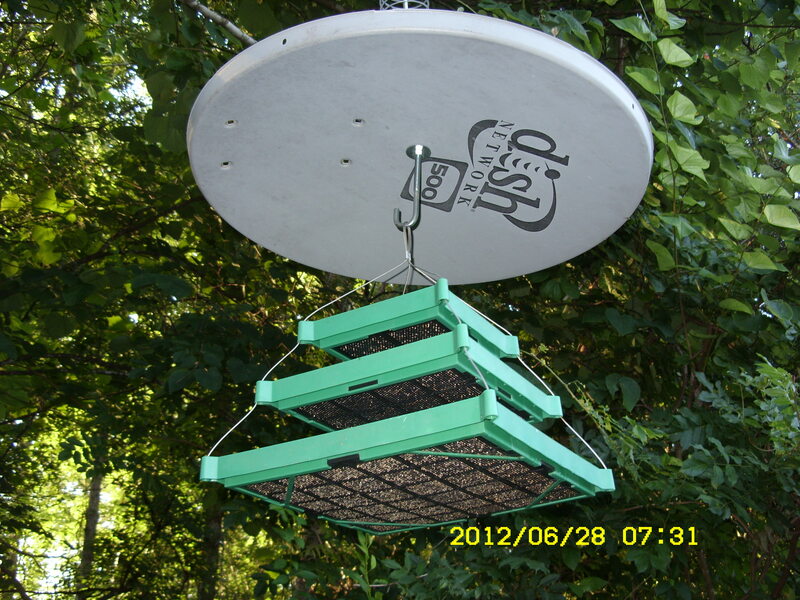 I’ll continue to put fresh mealworms in the little blue dish in hopes “my” Bluebird couple will return. 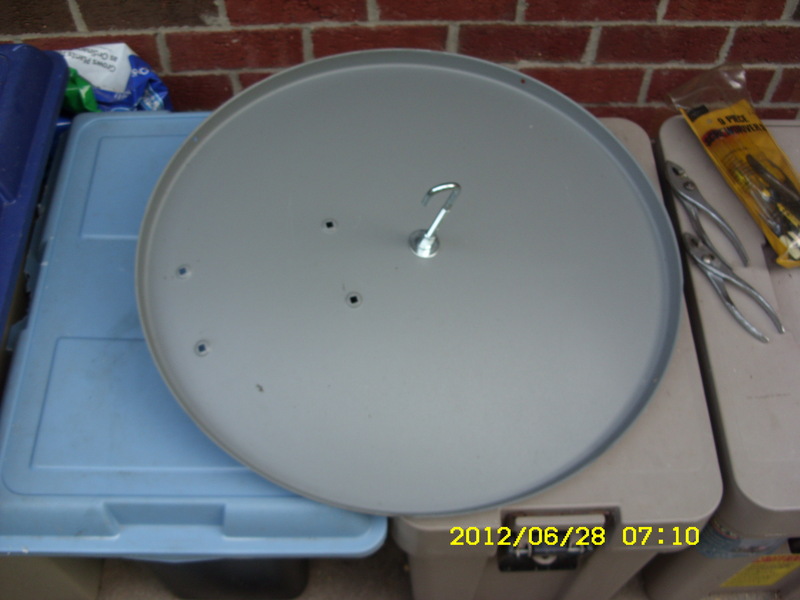 Do you have abandoned satellite dishes in your backyard? I had two… from previous tenants in my apartment. My apartment had been vacant for over two years!! 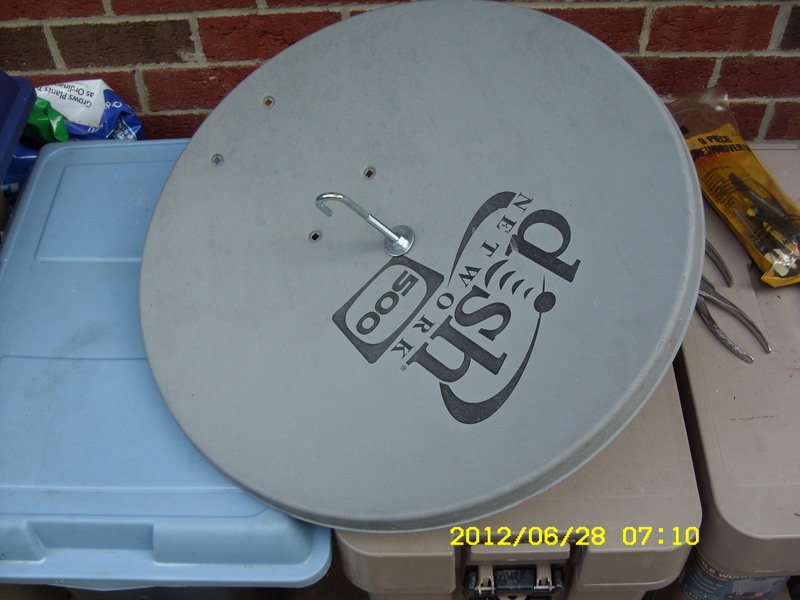 (Personally, I limit myself to “free” TV reception.) I’ve planned this project for several months and finally bought the hardware a few days ago. 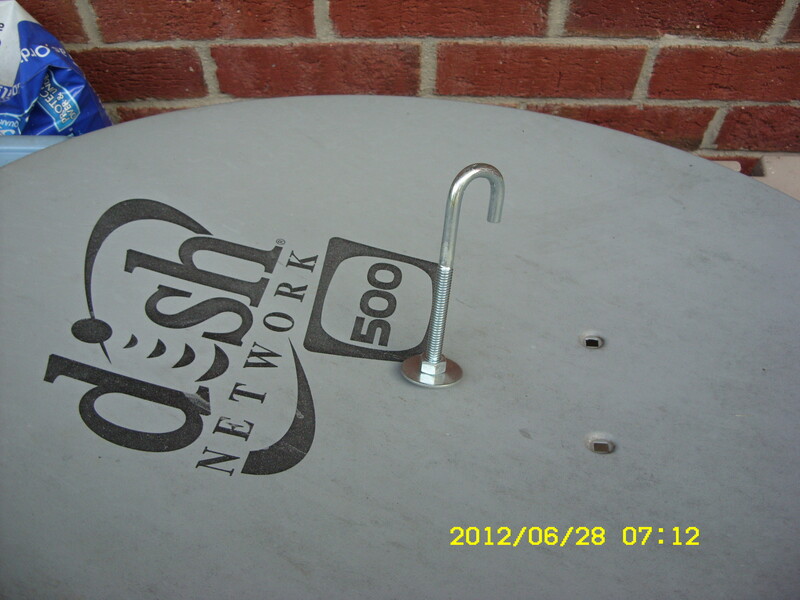 I “borrowed” the idea from a professionally built baffle that cost over $25. I paid less than $5. 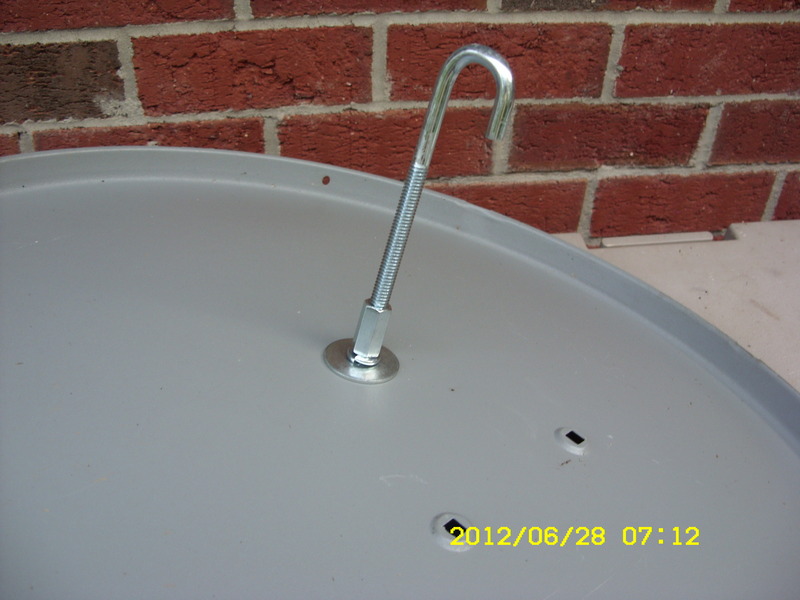 for the hardware for the satellite-dish baffle. 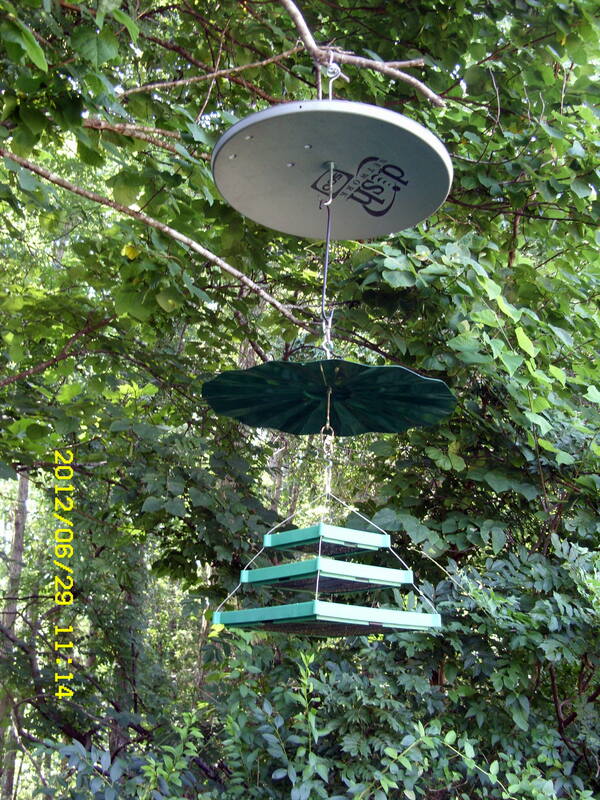 ~~ I doubt that my inexpensive item will stop the squirrels but “the creative side of me” wanted to attempt “building a better mouse trap” (building a better squirrel baffle). 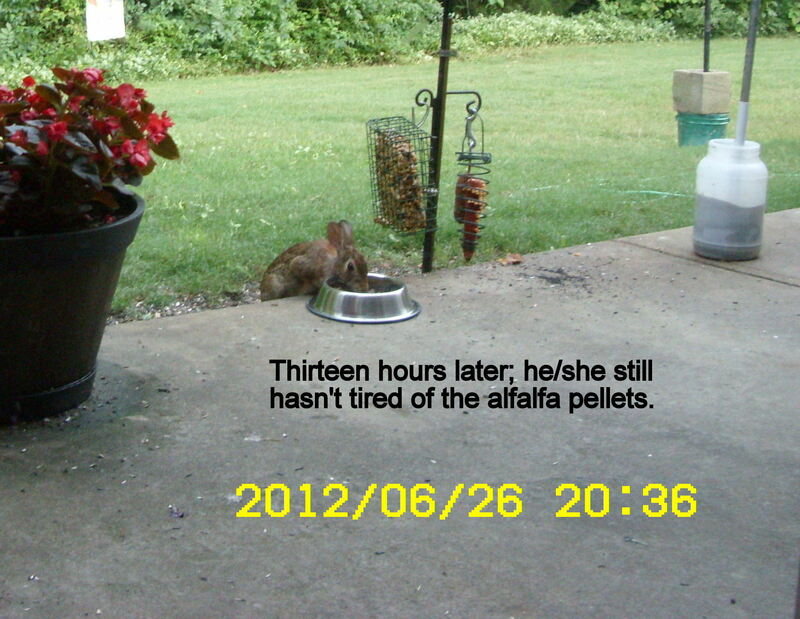 ~~ FYI: Prior to drilling the hole, the battery for my drill had to charge overnight. That explains my early morning project versus late afternoon, after work. Postscript, 7:00 PM: I was called to work mid-morning. 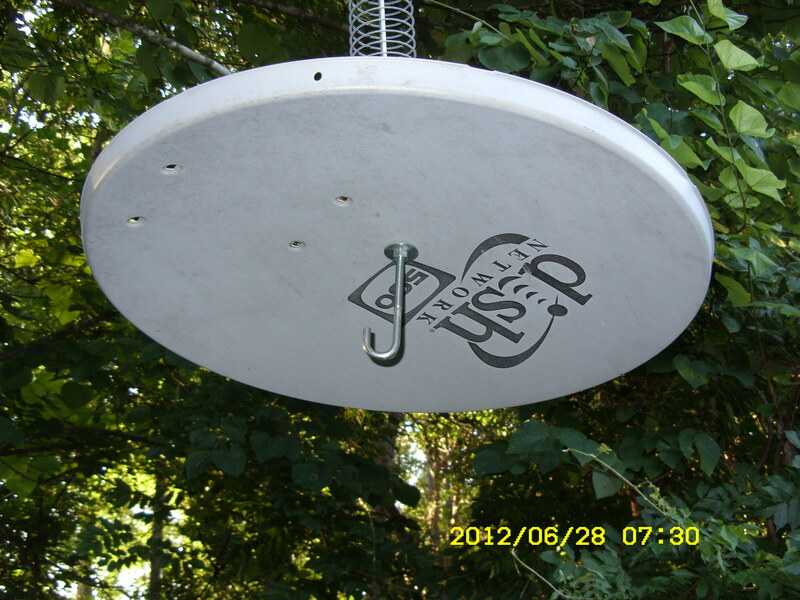 Back home, after work (after 5), I swapped the baffles before filling the feeder. 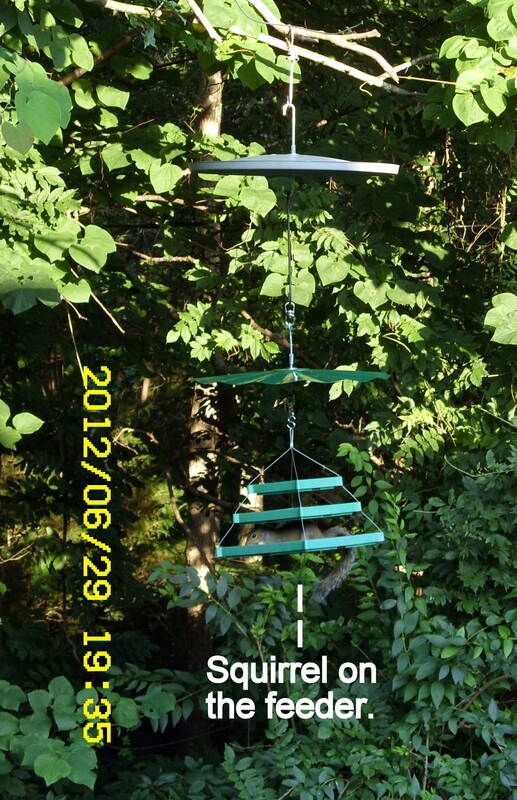 Time will tell, this arrangement might keep the squirrels off the bird feeder. Postscript, 6/29/12, 11:45 AM: Some women move the furniture around. 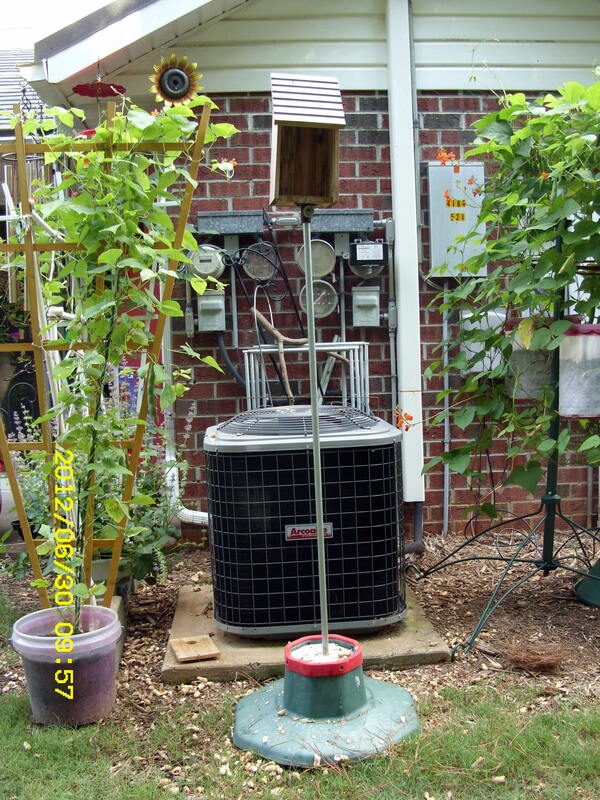 I move bird feeders, bird houses, hanging flower baskets–and baffles. I want things to “look nice” and I didn’t “like” the appearance of last night’s arrangement. 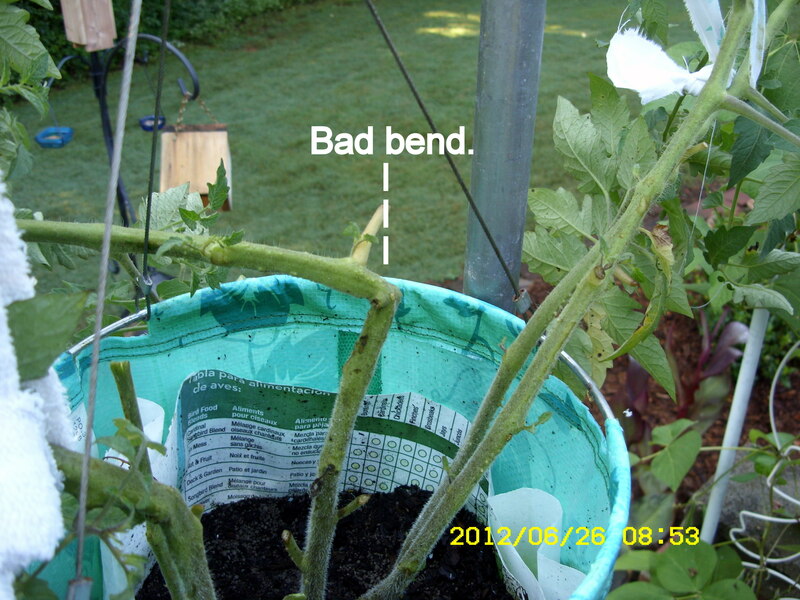 Postscript, 6/29/12, 7:45 PM: “No,” the new arrangement didn’t stop a squirrel. So you’ve seen the “bookends” of my day: Morning, before I went to the antique store. Evening, after I got off work. 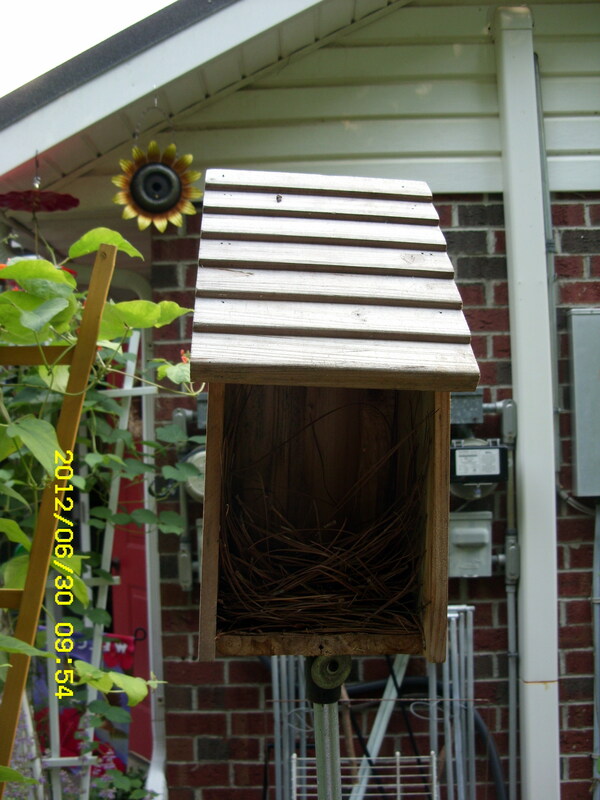 I was delighted to see movement inside the Bluebird house. 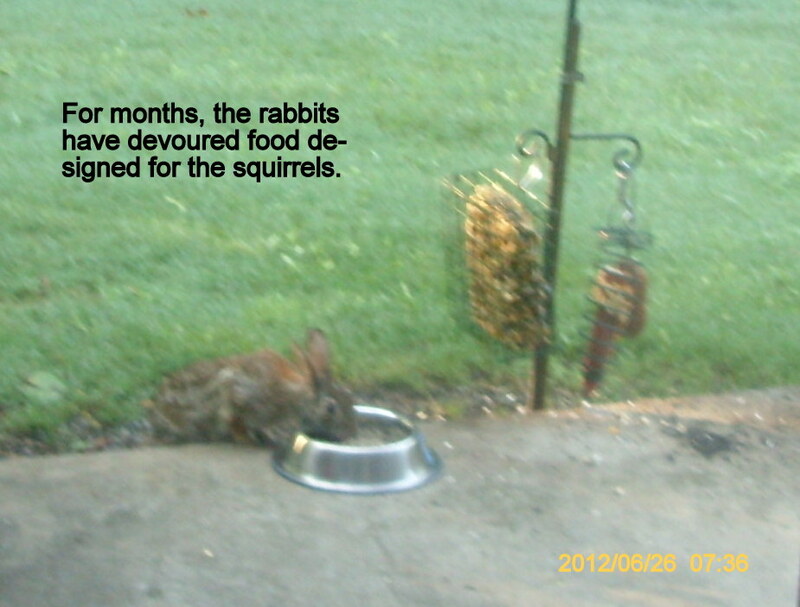 Mama and Papa Blue kept carrying mealworms into the house so I knew there were little ones.